Sanitation is one of the central issues that will be addressed in the regional hackathon [en] Developing Latin America [en] on December 1 and 2, 2012. The work of one particular project in Brazil could serve as inspiration for the development of new platforms. The initiative Sanitation is Basic! is part of the nonprofit organisation Meu Rio (My Rio) dedicated to civic participation through technology. According to the organisation, “half the population in Rio de Janeiro is still without mains water and sewerage”. This accounts for nearly 3 million citizens who are “[obliged] to drink dirty water or throw sewage directly into the rivers, lakes and beaches of this wonderful city”. A receita é simples: você aponta um problema, convoca outras pessoas que desejam a mesma mudança e pressiona diretamente políticos, empresários e administradores públicos, por email, Twitter ou Facebook. The recipe is simple: you point out a problem, then call on other people who want the same change to directly put pressure on politicians, businessmen and public officials, by email, Twitter or Facebook. O Secretário Estadual do Ambiente, Sr. Carlos Minc criou a Lei 2661/96 de 27 de dezembro de 1996 que exige níveis mínimos de tratamento de esgotos sanitários, antes de seu lançamento em corpos d'água, de modo que não ofereça riscos à saúde humana e ao meio ambiente, porém o mesmo permite tal afronto por parte destas instituições e compactua com o descaso ao carioca e ao meio ambiente. The Secretary of State for the Environment, Mr Carlos Minc, created the Law 2661/96 on December 27, 1996. This law requires minimum levels of waste water treatment before it is released into bodies of water, so that there are no risks to human health or the environment, but it allows such defiance by these institutions and colludes with the neglect of the people of Rio and the environment. Temos várias linguas negras que invadem nossas areias em períodos de chuva, porém o que é mais revoltante é o despejo proposital de todo o esgoto produzido na [favela da] Rocinha (…) desde à época do governo Garotinho. (…) No mesmo período foi criada uma estação de tratamento que deveria tratar esse esgoto antes de chegar à praia, porém a “Rio Águas” que é responsável pela estação, não faz o seu trabalho e despeja todo o esgoto “in natura” através desta galeria. We have several black tongues that invade our beaches during periods of rain, but what is more appalling is the deliberate discharge of all sewage produced in [the slum] Rocinha (…) since the time of the Garotinho government. (…) At the same time a treatment plant that would treat the waste water before reaching the beach was created, but the “Rio Águas”, which is responsible for the station, does not do its work and dumps all the sewage “in natura” through this culvert. Through Pressure Cooker, 415 direct messages have already been sent demanding “access to the complete technical project planned for the elimination of pollution on São Conrado beach, and [a guarantee] that the work will begin immediately” to the respective people in charge: the president of the Companhia Estadual de Águas e Esgotos (State Company of Water and Sewerage, CEDAE), Wagner Victer, the municipal secretary for the Environment, Carlos Alberto Muniz, the Secretary of State for the Environment, Carlos Minc, and the Foundation Institute of the Waters of the Municipality of Rio de Janeiro, Rio Águas. O Programa de Despoluição da Baía de Guanabara (PDBG) foi anunciado na Eco+92. Começou a ser executado em 1994, mas nunca foi concluído. Em duas décadas, a limpeza da Baía de Guanabara já passou por seis governos e custou R$ 1,5 bilhão em recursos. O esgoto continua sendo jogado na baía praticamente sem tratamento. Agora, surgiu o PSAM (Programa de Saneamento Ambiental dos Municípios do Entorno da Baía de Guanabara), que prevê gastos de R$ 1,13 bilhão em obras de esgotamento sanitário e em projetos de saneamento dos 15 municípios do entorno da baía. The Programme for the Elimination of Pollution in Guanabara Bay (PDBG) was announced in Eco+92. It commenced in 1994, but was never completed. 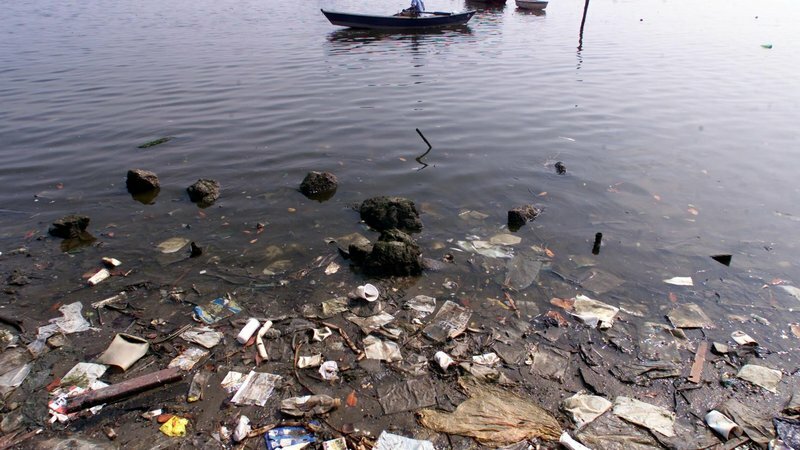 In two decades, the cleaning of Guanabara Bay has seen six different governments and cost R$1.5 billion [£460 million, USD $733 million] in resources. The sewage is still thrown in the bay with virtually no treatment. 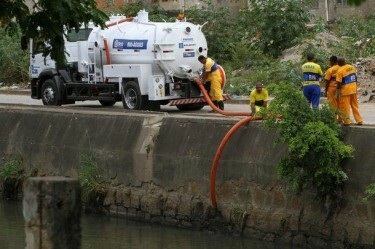 Now the PSAM (Environmental Sanitation Programme of Municipalities Surrounding Guanabara Bay) predicts costs of R$1.13 billion [£347 million, USD $550 million] for sewerage and sanitation projects in the 15 municipalities surrounding the bay. Queremos que a Secretaria Estadual de Meio Ambiente divulgue um cronograma com metas anuais do PSAM para que a população, as universidades e a mídia possam fiscalizar e garantir o sucesso dessa despoluição. We want the Secretary of State for the Environment to give us a timeline with annual targets for the PSAM so that the people, the universities and the media are able to monitor and ensure the success of the depollution. É um abuso ter que pagar um preço ainda maior de um dia pro outro, sendo que o serviço é péssimo. As contas vêm erradas, eles cortam a nossa água sem explicação, muitas vezes a água vem suja, e é muito difícil falar com eles no telefone para corrigir os problemas. Somos mal-tratados toda vez que tentamos. Sem falar que muita gente recebe conta sem ter água chegando em casa, e tem que pagar o preço pra não ficar com nome sujo. It is an abuse to have to pay a higher price from one day to the next, given that the service is terrible. The accounts are wrong, they turn off our water without explanation, the water is often dirty, and it is very difficult to talk to them on the phone to fix the problems. We are treated badly every time we try, not to mention that many people receive water bills without having water at home, and they have to pay the bill so they don't get a bad name. Nearly 2,200 messages were sent to the Ombudsman to the President of CEDAE, but according to the text of the petition mentioned above, he replied that “the increase will not be reviewed because there exists a decree that was signed 12 years ago that says that CEDAE can increase the water rates without passing through the sieve of an agency that ensures the quality of service and the need to readjust the price”. 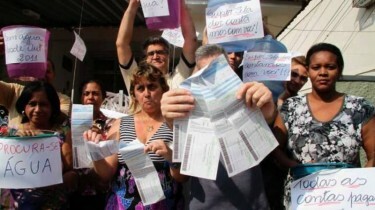 The petition launched by the Meu Rio cites the campaign of the citizens of Rio and addresses the Governor of the State of Rio de Janeiro, Sérgio Cabral, demanding the repeal of the decree 25.997/200 [pdf] which delegates power considered abusive by the organisation to the President of the CEDAE.